I was sketching on a sheet of paper infront of me, filled almost entirely with programming notes and fuzzy diagrams from the night before... when it occured to me that it'd be so much more sensible to be drawing something using my newly purchased wacom graphics tablet. 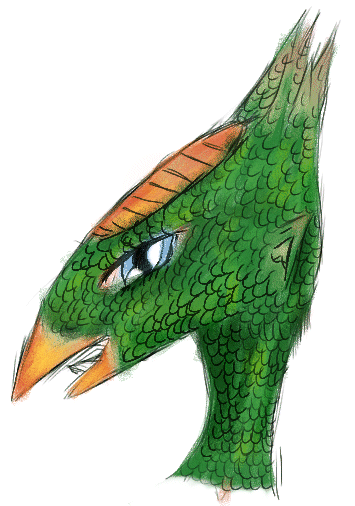 I loaded up Corel Painter Essentials (note: Essentials equates to 'bare minimum') and got drawing. I started off with an eye, a very long sleek eye, then built up a beak, then the head dress and then down into a neck. Then I coloured underneath the pencil work (oh wonderful layers) and above is the end result. A sort of bird. Calling it a woman is probably a bad idea, more of just female. Female bird creature. It has an eye of a human though, indicating intelligence. It was fun to draw. I'm sorta proud. I want to do more drawings like this so I can get better.